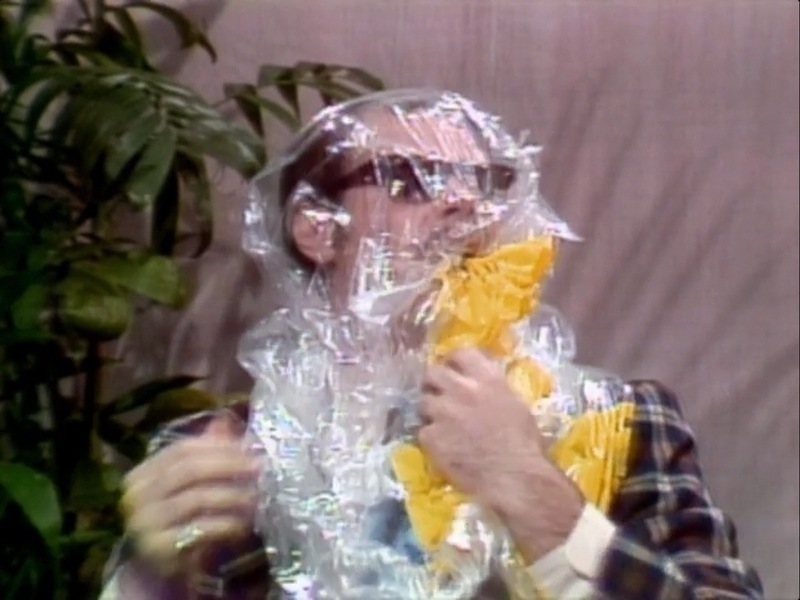 Why does this researcher have a “clear plastic bag” over their head? 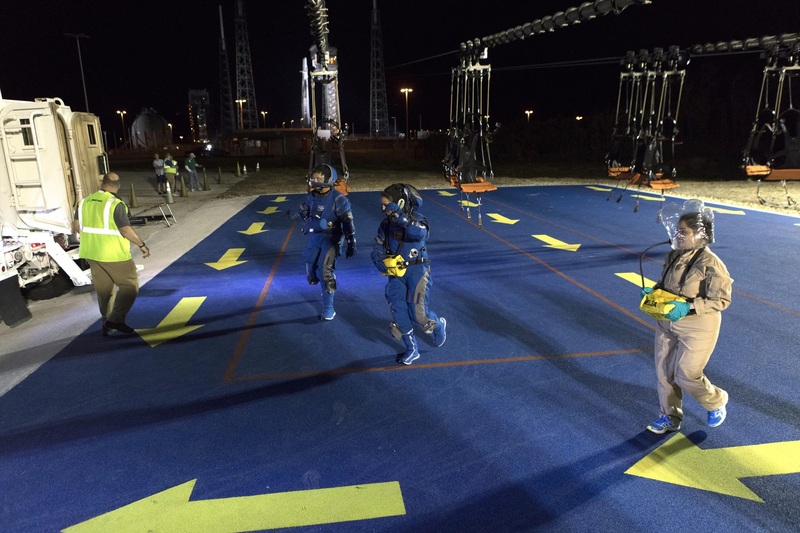 The Space.com article Astronauts Zip-Line to Safety in These NASA Emergency Evacuation Test Photos includes some interesting photos of the test. I show one of the photos below, plus sone cropped sections. I'd like to understand why one researcher has what looks like a clear plastic bag on their head compared to the helmets on the two people serving as astronauts, and at least one person with nothing at all. She is wearing an ELSA - Emergency Life Support Apparatus. It provides breathing air for a few minutes in case of emergencies, for example to escape a burning building. 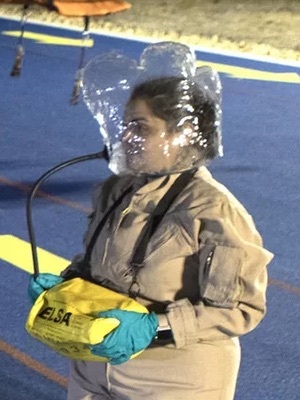 The clear plastic hood is used instead of a mouthpiece like divers use because it can be stored in a more compact way and it provides protection for the whole head against smoke and other toxic gases. It also allows the wearer to breathe almost as usual and doesn't need to fit the size of the wearer's head. She is most likely playing a worker who gets surprised by the emergency and wears her emergency rescue equipment she always has with her when working in dangerous areas. Miners use similar equipment, albeit usually a bit more sturdy. Why the "astronauts" are wearing their usually helmets should be obvious - they are more durable and more comfortable for long-duration use. 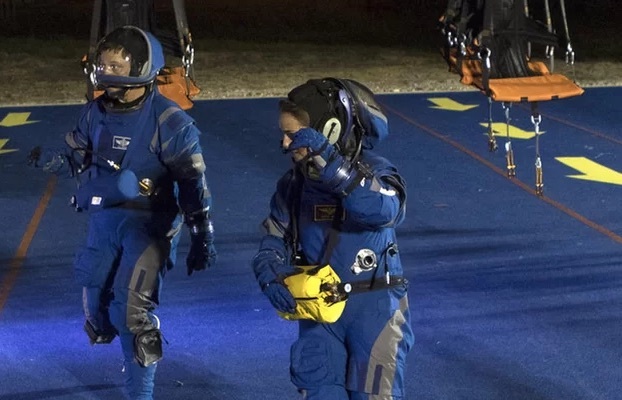 Note that one has the same yellow bag containing the air supply - they just connected it to the normal air inlet of their helmets to have a mobile air supply. The guy without any protection is likely not part of the drill - just an outside observer. 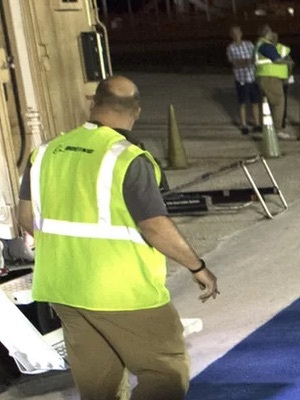 Note that he is also facing the wrong way - everybody else is walking away from the emergency seats hanging behind them that got them quickly away from the danger zone near the rocket in the background.